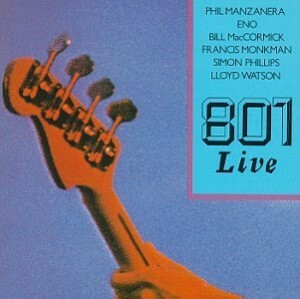 801 Live is a live album by a short term project featuring Brian Eno and Phil Manzanera. It was recorded at the Queen Elizabeth Hall in London on 3rd September 1976. The original version with 10 songs. An expanded 12 song Collector’s edition with two Eno songs added – Golden Hours and Fat Lady of Limburg. A two CD version with the 12 song version on CD 1 and a recording of the rehearsal at Shepperton Studios on 23 August 1976 on CD 2. This doesn’t include Golden Hours but reprises Lagrima. The version I’d look for is the 12 song 1999 CD. 2. TNK (Tomorrow Never Knows) – cover of The Beatles song on Revolver. 3. East Of Asteroid (this is a reworked version of Quiet Sun’s song Mummy was an asteroid on Mainstream combined with the Phil Manzanera song East Of Echo from Diamond Head). The album received critical acclaim and the band reformed in 1977 to record the studio album Listen Now which they also promoted with live concerts. By this stage, the writing was done by Phil Manzanera and Bill MacCormick although the others appear on the album. This 1977 tour has resulted in more live albums. Is it the best live album by 801? Which do you recommend? This entry was posted in 1970s Live Albums, Progressive Rock Live Albums and tagged 1970s Prog, 1976 live albums, 801 Live Albums, prog 1976 by Paul Simister. Bookmark the permalink.